Whitefish Mountain Resort has been one of America's favorite destinations for good times, good people and good snow since 1947. Rising above the historic railroad town of Whitefish, the resort has gained notoriety for its laid-back vibe, world-class skiing and spectacular summer recreation. Consistently ranked highly in SKI magazine's annual reader survey, it is just as well known for a pleasant lack of lift lines as it is for friendly people and deep powder. The resort's central peak accesses more than 3,000 acres which receive more than 300 inches of average snowfall. Less than 20 miles from Glacier Park International Airport, the Mountain Village offers a full range of amenities, including fine dining, shopping, entertainment and family-friendly activities. December 7, 2017 to April 8, 2018. Daily 9:00am - 4:00pm Night skiing late December to early March on Fridays, Saturdays and select holidays. Visit skiwhitefish.com for current operating hours. Whitefish Mountain Resort is located 8 miles north of Whitefish, 23 miles north of Kalispell, in northwest Montana. Glacier Park International Airport is served daily by flights from Salt Lake City (Delta), Minneapolis (Northwest), Seattle (Alaska/Horizon), and Denver (United) and others. Shuttle service and car rentals are available. The historic Whitefish Depot is served daily by rail (Amtrak) from Seattle, Portland, Minneapolis and Chicago and points in between. 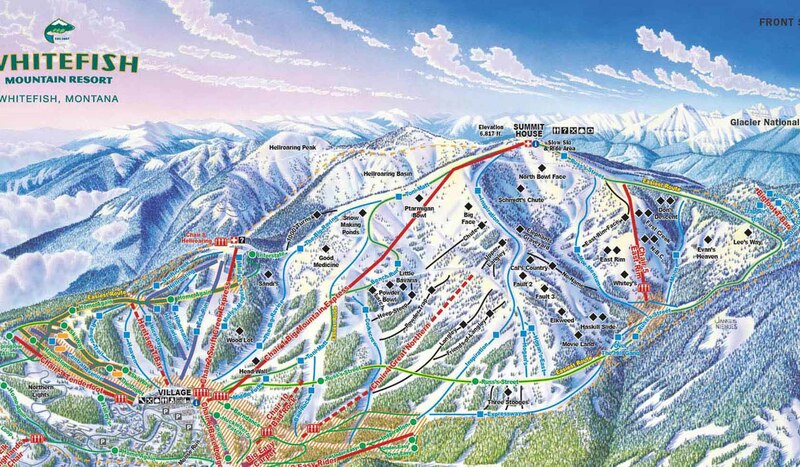 3 high-speed quad chairlifts, two quad chairlifts, six triple chairlifts, two t-bar lifts, one carpet conveyor lift.